Fact: Jane Tanner became the principal and only witness regarding the sighting of " a stranger carrying a child" who went on to become the corner stone of the McCann's abduction story. All emphasis mine, this is a much slimmer and easier to comprehend version of a previous post. Firstly let me set the scene, this extract from Amaral's book. The first investigator who went to the apartment after the alarm was raised was informed of the existence of a plan for checking on the children while the parents dined one hundred metres away. At the time, Russell O'Brien handed over two lists handwritten on the inside cover of a children's book, a sticker activity book for children more than 3 years of age. We believe the book was Madeleine's and we do not understand why they tore off the cover of the child's book. A child had just gone missing and all its belongings should be precious to those who loved her. Was there really no other paper around? Not even a simple napkin? The question hangs in the air and the response is yet another contradiction. The lists contained the possible record of the checks in the apartment. That it was Madeleine's book is not vital to the case but it is a good indicator to what was seemingly transpiring in apartment 5A the alarm was raised. Not Vital as I say, but worth remembering when I pose a question a little later on. The next Extract from Russell O'Brien's Rogatory interview does give us two pieces of information, one extremely important piece of information is that it places Gerry McCann in the apartment at the time O'Brien was writing the timeline, at the same table even, and the other: "I thought it was a cereal box" is worth remembering. In response to a question from Leicester plod. that (it) was written with me sat at the table in Kate and Gerry’s room. Gerry by this point had certainly calmed down but was, his head was just on the table, you know, like that, he was just staring at the, at the table, very, very quiet and very, very low. LP. “Was the first attempt, the earlier attempt as you say. 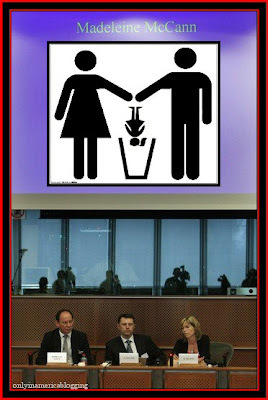 When was this drafted up”? Let us now look at some bits from Jane Tanner's Rogatory statements. I didn’t want to say to Kate at that point, which might sound odd now, you know, ‘Oh why wouldn’t you say straight away to Kate’, but, you know, the thought of telling the mother of a child that you might have seen being carried away is, it’s too horrible to even say. JT.“That was at three o’clock in the morning after she’d disappeared, yeah”. JT. “Erm, I think there was Russ, I think Russell came with me and there was Sylvie who was the translator. I can’t remember which, there was some, there was a PJ chap was sitting on the, by the table.And there was Gerry who was standing by the, the bedroom door”. JT.“Oh he was just, well obviously, obviously distraught. And I think it was quite hard for me to be saying at that, you know, looking in his face and to be explaining what I’d seen, at that point was quite hard because, you know, Gerry was obviously standing there, I don’t know whether, and you sort of think ‘Oh God, here’s me, if I’d tried to stop them this wouldn’t have happened’ sort of thing.So I think I did feel sort of a bit obviously guilty at that stage even though I didn’t know whether it was anything, but obviously you think ‘Oh bloody hell, what if I’ not stopped it happened potentially”. JT. “Well I don’t even know whether he took it in, I mean, he was just, he was, you know, obviously just standing there looking absolutely horrified, so”. Prior to the PJ arriving at 12:40/12:50 Russell O'Brien has written the timeline for them all, including, "Jane tanner sees stranger walking carrying child." He does this while Gerry McCann sits at the same table. At three o' clock in the morning Jane Tanner informs Gerry McCann for the first time, about the existence of a possible abductor. Gerry looks horrified upon hearing this. Err hello, hello mister English policeman, are you there? Firstly let me dispense with the book. Having read all that O'Brien has to say I would have difficulty in believing that Monday followed Sunday if such statement came from his lips, but for once and for purposes of this article I shall go with one sentence being the truth. "I thought it was a cereal box but obviously it was a children’s book." At first glance it might not seem so terribly important but it does bother me somewhat and makes me ask who handed the torn book to O'Brien, who would feel comfortable enough to tear up a book belonging to a child, someone else's child and a recently "abducted" child to boot? How likely is it that one of the Tapas Seven would tear up a book belonging to Madeleine? for all their faults I would say they have enough social graces that to do such a thing would be totally alien to them, who then? Well it can't have been Gerry can it? because according to Jane Tanner she didn't inform McCann until three in the morning that she had in fact seen a possible abductor. But that begs another question, especially with Gerry being placed in the apartment at the time. 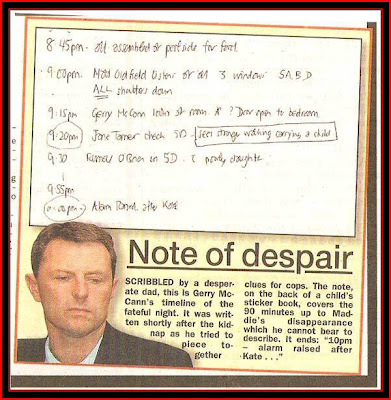 How did O'Brien and Co. conjure up so surreptitiously the timeline, commit it all to paper duly noting Tanner's 9.20pm sighting of the possible abductor without the knowledge of Gerry McCann who was, at the very time the thing was being drafted,was sat with his head resting on the same table. (...)On the night of 3rd May 2007 he was on duty at the Portimão DIC, in the company of Inspector Manuel Queirós, who was acting as head of the station. 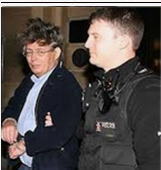 When questioned he confirms the integrity of the service information drawn up from the station’s inquiries carried out in the early morning of 04/05/2007, adding that he arrived on the scene about 30 – 40 minutes after the phone call from the GNR, at about 00.40/00.50. 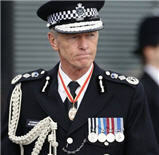 (...)He was brought into service together with an Inspector from the station. 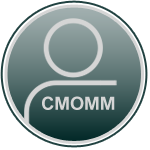 It was the inspector’s duty to take notes of the services as well as all the information relating to them. The inspector who accompanied him on that date, Vitor Martins, informed him that the case in question was that of the disappearance of a small girl, of British nationality, who was staying at the OC with her parents. The immediately left for the scene and arrived about 30 – 40 minutes later, at about 00.40/00.50. They are not just liars, they are terrible liars. Jane supposedly sees a man carrying a child away while Gerry stands on the same street, Madeleine is claimed (announced) to have been abducted (and is gone by 10:00pm) and Jane says 'nothing' to anyone about this (bogus) sighting until 3:00am? I puzzled over this. Then I read in a police statement that they handed over this written timeline when they went for police interviews later on 4 May. This noted this was what they had tried to dive to the investigators at the apartment. Amaral says ROB handed these over. He doesn’t mention that they were handed back to ROB. It is possible then that JT first mentions the sighting at 3am and ROB adds the words “sees stranger walking carrying a child” to the timeline at that point. Neither JT nor anyone else mentioned this to the GNR or PJ Investigators who arrived. If this information had been know to ROB etc when they drew up the timeline, one of them would surely have mentioned this to the police. This can be explained if that detail wasn’t added until later i.e. 3am when JT first mentions this - when also with ROB - who would surely have added this key info to this timeline. If no Tannerman before 2am, no Tannerman at 9:20pm when JT claims to have seen him. I hope it's a fair assumption to say from the post above that @Dannz feels the first time JT sighting was mentioned came after 3am (or he/she feels it ambiguous before this hour, though no documented context is given). I wonder if this can be quantified in files. When are the sticker book timelines alibied as having been written? Bearing in mind GNR statements need to be cross referenced for accuracy by this point (ie not indifferent testimony). Does the 'no Tannerman before 2am' assertion stand up to scrutiny? if JT actually sighted Tannerman why not say anything to the GNR or PJ who were at the apartment? 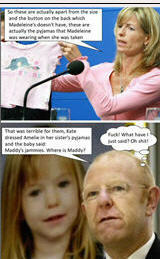 Open window, whooshing curtains, Kate and Gerry screaming that paedophiles have taken Madeleine. Wouldn’t mentioning Tannerman perhaps seem relevant? @Dannz wrote: I read in a police statement that they handed over this written timeline when they went for police interviews later on 4 May. Dannz, I noticed you have been asked by a moderator (several times) to do research before posting. Are you confusing the sticker book timeline with the typed one, handed over the following week? @Dannz wrote: Amaral says ROB handed these over. He doesn’t mention that they were handed back to ROB. [PJ officer 'Baby Face] "turning round to me writing the timeline and saying ‘That’s what we want’, fair enough. Erm, huh, and that’s really it." 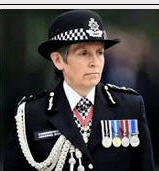 Estimated time between 00.30 and 1.00 am Two timelines written by Russel O'Brien on the covers ripped off Madeleine's stickerbook are provided to the GNR officers. 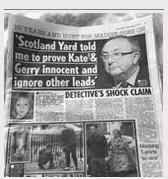 "Gerry was also insisting that they speak to Jes Wilkins, in case he had seen the man and child reported by Jane"
So Jes Wilkins saw nothing, he told Matthew so and Matthew told Gerry McCann at around 1 am on 4th. Ten hours later Gerry insisted that the police also asked the question. Did he think Jes Wilkins might have changed his mind? Did he want them to ask the question because he knew the answer? Did he tell his wife he had insisted but hadn't? 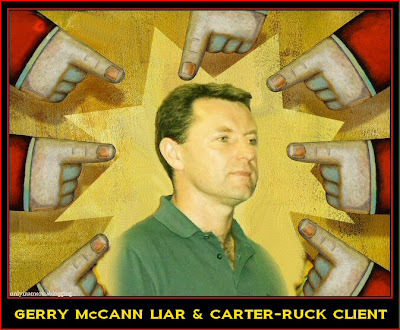 Or was Kate McCann mistaken? At some point she translated the statement of one of the ladies who belonged to the group and that she describes as a brunette one. This lady said to the GNR elements, and she (the witness) translated, that she had seen a man on the road who might have carried a child.